Udupi, Aug 1, 2016: All focus in Udupi district today August 1, 2016, in the Karavali canara region is on the shrine of St Lawrence at Attur all set to be proclaimed a Minor Basilica by representative of Pope Francis. Thousands consisting of Cardinals, Bishops, rweligious and faithful have headed for this holy town near Karkala. The Udupi diocese has been making preparations for the special occasion from the past three months, after Pope Francis elevated the shrine into a ’Minor Basilica’ status through a decree on April 26, 2016. Giving details about the preparations, Shrine Rector Rev Fr George D’Souza said the preparations are almost complete and three cardinals, archbishops, bishops, 300 odd priests and nuns and more than 12,000 devotees are expected to take part in the grand ceremony, which would commence with a procession at 9.30 am. As many as 12,000 seats have been made at the church grounds. While the grand mass would commence at 10 am, the public function would begin at 11.45 am and conclude by 1 pm, which would be followed by lunch. More than 25 mass food counters have been set up for the purpose. 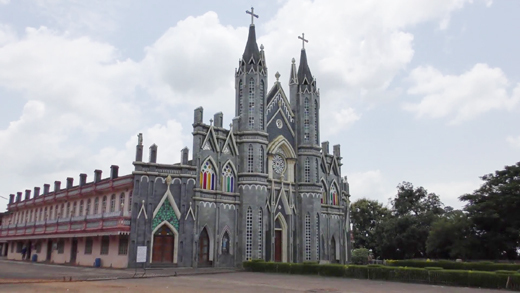 LED screens would be put all over the church as well as outside the premises, so that each and every devotee should not miss the historic event. As many as 450 volunteers would be ready to help the devotees. The reception and information centers are put up at the entrance of the church to offer information to devotees and the visitors. Karkala ASP is in charge of the security arrangements and an ambulance would be pressed into service in case of emergencies. Elaborate parking arrangements have also been made. Vehicles of only VIPs and VVIPs would be allowed inside the church premises. The high school ground in the adjacent area would be used for the vehicles of the devotees and visitors. As many as 40 each volunteers and Home Guards will be available at the parking zones to offer proper guidelines. Toilets for the visitors and devotees are kept open in the religious institutions situated in and around, he added. There is an upbeat mood in general on this historic happening. St. Lawerence Bless us all. Huge number of Devotes may gather and be a part of Lord’s Blessings .